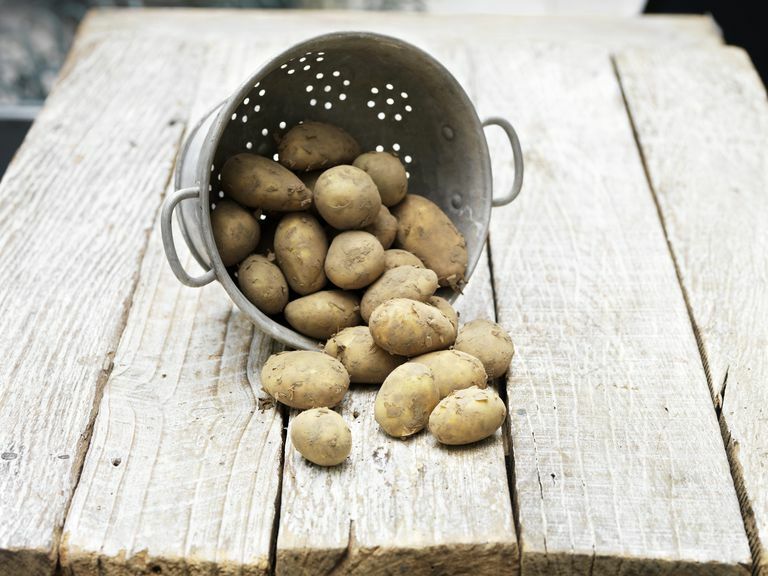 Does Soaking or Rinsing Potatoes Reduce Starch Content? Things that sound too good to be true usually are, and that's the case with the claim that soaking or rinsing potatoes before cooking them removes the starch. There really isn't any way to reduce the starch and potatoes are high in starch no matter what you do with them. All washing or rinsing does is remove some of the starchy residues that get stuck to raw potatoes when you slice or chop them. Although It doesn't change the nutritional value of potatoes, rinsing can important as far as cooking goes. Rinsing your cut raw potatoes is a good idea if you're going to fry them because that residue tends to burn before the inside parts of your potatoes are cooked. Pro tip: Make sure the potatoes are dry before adding them to hot oil, or they're going to spatter, which can make a mess and burn you if you're too close. The typical potato is about 18 percent starch. Most of the remaining part of the potato is water (about 75 percent) with a bit of protein, minerals, and vitamins. There are also tiny bits of amino acids, organic acids, and other bits that give the potato its flavor. Starch can be kind of good and kind of bad. On one hand, it's what gives a potato such a pleasant texture when it's cooked. On the other hand, it's not so good for a person who's following a low-carbohydrate diet. But if you're not on a low-carb diet, potatoes can very good for you because they're high in potassium and vitamin C, and if you eat the skins, you'll get a bit of fiber. But if you're following a low-carb diet, you'll probably have to forego potatoes — you're better off substituting low-carb veggies like cauliflower or celeriac. Do Red and White Potatoes Have the Same Amount of Starch? Not all potatoes are the same. There are slight variations in the amount of starch found in different kinds of potatoes. Those variations aren't enough to proclaim any potato to be a low-carb potato, but it is enough to make certain potatoes better for specific types of preparation. Potatoes that are the highest in starch — such as Russets and white potatoes — have a mealier texture that's perfect for making mashed potatoes or for baking. But after they're cooked, white potatoes don't hold their shape, so they're not suitable for salad recipes or soups and stews. Potatoes with a little less starch such as reds and yellows have a creamier texture and hold their shape longer, so they're best for soups, stews, and salads. Reds are best for these recipes. United States Department of Agriculture Agricultural Research Service National Nutrient Database for Standard Reference Release 28. "Basic Report: 11352, Potatoes, Flesh and Skin, Raw." Y. H. Hui. "Handbook of Fruit and Vegetable Flavors." Hoboken, NJ. John Wiley & Sons, Inc., 201.